What is Thorngully all about? We're all about Texas. That means big skies, thorny trees, and beautiful sunsets. We grew up in rural Texas. Living in the city left a yearning for open spaces, Spaces where we could walk under ancient mesquites without constant background chatter of traffic. A place where horned owls and jack-rabbits (and a few rattlers) make up most of the neighborhood. And every meal is grilled over an open fire. This idea was the birth of Thorngully. We are not a state park. We created a freehold for people to take a break, Have a beverage or two, and enjoy a hike before returning to camp (with your empty cans) to enjoy a fire under the stars. Thorngully is a primitive place. To improve accessibility, we've cut roads, leveled terrain, and felled trees, Bathrooms and showers are on the to-do list. At present we have 2 miles of dirt roads and trails to cruise around on and 70 acres of woods. Of these, over 30 acres are deep mesquite woods reserved for hike in camping only, not quite accessible by car. We open this space for guest enjoyment and recreation. There are two rules: safety first, love and respect all things. York creek divides the property in half. Offering a mile of tree lined banks for fishing or exploring. Well socialized pets are welcome off leash at owners risk and liability. . In return we ask that those who use it leave it in as good or better shape than when they found it. Guests must pack out all refuse. Green wood cutting is allowed only with express permission of property owners, and please refrain from shooting anything (especially the cows)! Turning into the Ranch: Thorngully is secreted away off highway 20. We have our main entrance right off highway 20 where you'll be able to see our sign. A simple cattle gate is all that's required to enter and you're on your way. Please make sure to close the gate behind you as one of our permanent guests is a small family of cows and they do like to wander. Where to camp? : Depending on preference there are a number of great spots to camp. The first quarter mile of drive into the property offers lots of shade and most of the year a green carpet of grass. It's close to the highway making it convenient for people who like to pop out to re-supply or run into town for a bite to eat. After this you'll see our large metal barn off to your left and the small field which will be the future site of the bathrooms. Continuing on another quarter mile or so the road will turn you in a much a larger field lined with trees and bordering our pond. This is our most popular camping area as it offers lots of shade, ample parking, and usually has a nice breeze. The property continues on for another half mile of dirt roads but we don't recommend anything without sufficient ground clearance or fresh paint past this point as it gets a little rugged. There is a cut away bank on the creek and several spots where crossing on foot or dirt bike is fairly easy and that will lead you to the big mesquite grove. Have fun and explore! Please also remember that there is abundant wildlife including some critters that bite or sting. Be cautious when reaching for wood or picking up anything you can't see under. The Cows: This is a working ranch. Our small herd is owned by a local rancher and we allow him grazing rights. They keep the grass trimmed and the trails open. They're our permanent landscaping department. They are fairly used to people and curious. If they approach you and you're uncomfortable just calmly walk away. Please do not approach or try to pet the animals. Fishing: If you like lots of action with (usually) smaller fish we have plenty. The creek, as a public water way, can be fished by anyone with a Texas permit. Our stock pond can be fished by anyone visiting the property and has bass, catfish, and perch. We do request that you catch and release so there will be plenty for the next person to enjoy. Bikes: Bicycles and Dirt bikes are welcome! We ask that everyone on the front half of the roads to keep it under 10mph for safety and be aware that there are some very steep and sudden ravines an gullies scattered through out the property. Be careful and have fun! Swimming: Although York creek has some deep spots and is fed from a local spring we prefer to swim just up the road. Just up the road 5 min on hwy 621 is a local swimming hole offering intensely blue, cool water and a rope swing for the adventurous. Cutting Wood: Wood is abundant. If it's on the ground and dry you're welcome too it for your campfire. As of now we have more wood than days to burn it. Also any mesquite or huisatch saplings that are in your way (under 3" thick at the base) feel free to remove. If you have any questions about larger branches you might want to remove to make a camping area more accommodating please ask first. We love our big old trees and want to keep them healthy and happy. 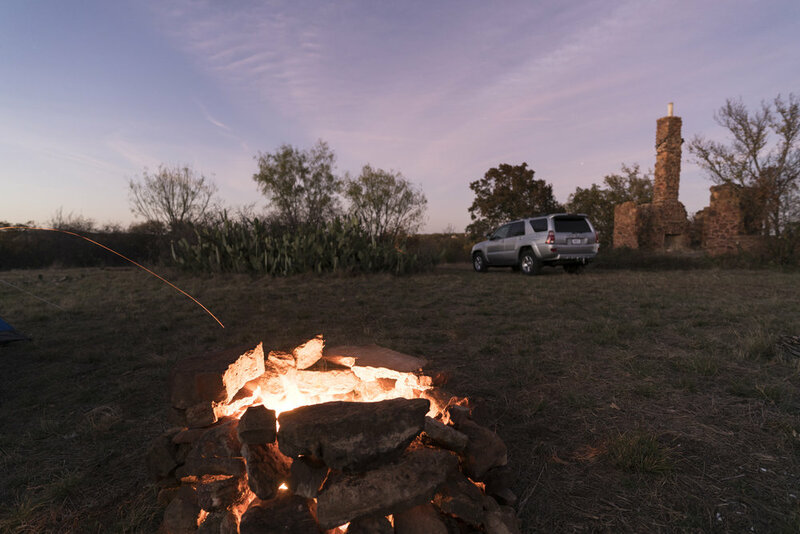 The property is spread over 100 arces of Mesquite trees, creeks, and open fields perfect for a mixed camping experience. The rule here is "if you're not in the road, it's fine." Any spot that looks appealing is all yours. The only caveat to this is fires. Off the ground fires in a container are permitted anywhere you're not going to set the tree above you ablaze. If you would like to have a ground fire we have designated areas, mostly around our central camping field. These are designated by circular metal tubes. There are limited field spaces accessible by car at the moment. If you require a large outdoor area we do have a 30 acre field that is mostly cleared and will be available for use in the near future. At the moment its mostly just a big think to walk through or ride over! Take a look at all that we have to offer via our photo gallery! Our annual get together. As the year cools down we like to open up the ranch for motorcycle enthusiasts of all stripes to come enjoy some friendly games and camaraderie. We have a mini dirt drag race, an 1/8th mile flat track open for use, and a weekend bonfire for riding around and letting loose. If you need a lot of space for a private party or event we can do that! Give us a call to discuss daily or weekend rates. We are happy to work with you to meet your needs. Another future possible use of the space. As the infrastructure develops more we will be opening up the ranch for music gatherings and festivals. What is involved in booking an event here at Thorngully? Give us your dates and needs! We'll do mowing/trimming to accommodate larger or smaller gathering. Check out the recap video from our 3rd Moto Creek Rally!